Jesstar's Ramblings: Blogtober Day 7: What's on your work desk? Blogtober Day 7: What's on your work desk? Wednesday means time to share what's on your work desk. Normally this would be what's on your craft work desk but more me I've been at work all day so I have a different desk in front of me. 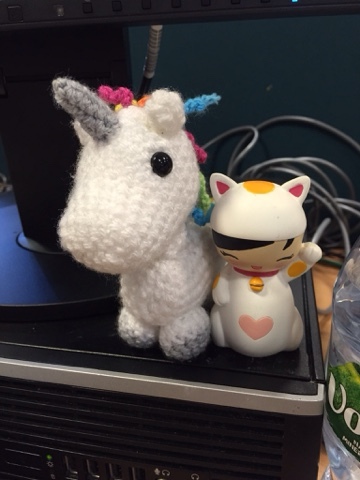 I can't share too much of my desk but these little guys keep me company during the day. I collect Momiji dolls so when I saw the lucky cat doll I had to have one. I love lucky cats, they're so tacky they're brilliant! The unicorn was made for me by my Facebook friend Emma. I'd shared a link from Hobbycraft and said I wished I could crochet, a couple of days later she messaged me with a photo and said he was mine!